Marine and estuarine shellfish beds are an ACFHP priority habitat in the North Atlantic, Mid-Atlantic, and South Atlantic subregions. Along the Atlantic coast, shellfish beds are primarily oyster aggregations/reefs, scallop beds, hard clam beds, or shell accumulations. Oyster aggregations and reefs are structures formed by the Eastern oyster (Crassostrea virginica) that provide the dominant structural component of the benthos, and whose accumulated mass provides significant vertical relief (> 0.5 m). Scallop beds are areas of dense aggregations of scallops on the ocean floor. Common Atlantic coast species include: (1) the large Atlantic scallop (Placopecten magellanicus), which ranges from Newfoundland to North Carolina; and (2) the medium-sized Atlantic calico scallop (Argopecten irradians), which occurs from Cape Cod to Florida, as well as in the Gulf of Mexico. Hard clam beds are dense aggregations of hard clam (Mercenaria mercenaria) found in the subtidal regions of bays and estuaries to approximately 15 m in depth. Clams are generally found in mud flats and firm bottom areas consisting of sand or shell fragments. Shells of dead mollusks sometimes accumulate in sufficient quantities to provide important habitat as well. 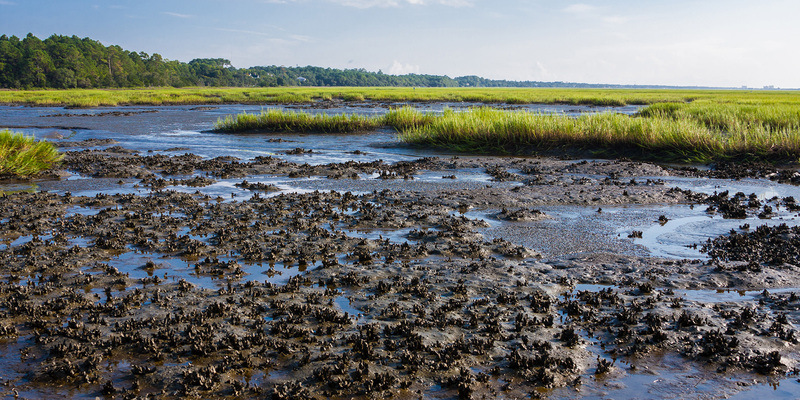 Accumulations of Eastern oyster shells are a common feature in the intertidal zones of many southern estuaries. Shellfish serve a variety of functions, benefitting both the ecosystem and people alike. They are great for improving water quality. Did you know that a single oyster is capable of filtering 50 gallons of water each day? By doing so, they remove excess nutrients, contaminants, and suspended sediments from the water column. Shellfish also provide habitat and food for estuarine species. Their structure is especially important for nursery species in need of shelter from larger predators. Their sturdy reefs stabilize the sediments and reduce the threat of coastal erosion. For this reason, they are great buffers against storm surge, which is an ever-increasing threat along the Atlantic coast as sea levels rise and storms intensify. Shellfish, and especially oysters, also contribute millions of dollars to the East Coast’s economy. Some even say New York City was built on oysters. They have been a staple food source on the Atlantic coast since before Europeans arrived, and are still considered a delicacy today.